Hi! I am an Associate Coach for the Guelph based triathlon club, Loaring Personal Coaching. I work under the guidance of James Loaring and Mark Linesman. I am also a professional triathlete and I compete internationally for Canada in ITU and XTERRA events. I have been a triathlete for over 10 years and been a member of Canada's Development and National Teams. I live and train in Guelph with the goal of racing the 2020 Olympic Games in Tokyo. Triathlon has been a part of my life since I was 14 years old. I grew up in the small town of Carp, ON, in the Ottawa Valley, and grew to love running in elementary and high school. After "racing" my first triathlon in Ottawa I was absolutely hooked. I went on to train full time and place 3rd (2010) and 6th (2011) at the ITU Junior World Championships. 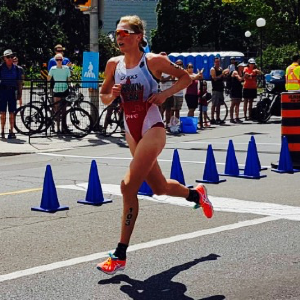 At the age of 18, I moved to Guelph to train at the Triathlon Canada Performance Centre under the watchful eye of Craig Taylor. With Craig's help, I placed 3rd (2012) and 5th (2013) at the U23 World Championships. I am a student at the University of Guelph currently pursuing a Bachelor of Commerce degree. I have been very fortunate to be a three-time member of the varsity cross country running team and to watch and learn from varsity coach Dave Scott Thomas. I am very passionate about triathlon and about helping athletes set goals and meet them. I have coached a number of kids camps and technical swim clinics. Success. Coach Joanna Brown has been notified of your message.